Concrete is one of those materials that is best suited for the construction site, right? Well, perhaps not. In a trend that is sweeping the world, designers and home owners are adding concrete vanities into the bathroom environment – creating a grey point of difference. To call this design trend ‘interesting’ is certainly understating the role it could play. If you want to explore something outside the box that your friends and family haven’t seen before, concrete vanities could be just what you’re looking for. Here are several advantages of using concrete as a material in your bathroom design. If you’re selecting porcelain or marble vanities, you’ll most commonly have to select a make and model from a catalogue. Although there is room for custom-made vanities, you’re somewhat limited when selecting certain materials. With concrete bathroom vanities, we try to stay away from the ‘cookie-cutter’ solution. Right from the start of the design process, you can play an active role in designing something creative and spectacular for your bathroom. Use coloured stones, pieces of glass or even shells to develop a personalised style. It doesn’t matter the design, size or shape – concrete is a versatile material. It’s important to remember that if cost is a factor in your bathroom design, you can still take advantage of concrete as there are standard sized concrete vanities available. Moreover, there is an impression that anything concrete is very heavy, but again, light weight concrete vanities can be installed. Another quality that concrete is famous for is its strength. In a space like the bathroom that is used daily, it’s critical to use materials that can stand the test of time. With proper maintenance, concrete vanities can last upwards of 50 years – perfect for family bathrooms or powder rooms where the surface will see its fair share of wear and tear. If something does need to be repaired, patched or released, concrete is the ideal material to work with. 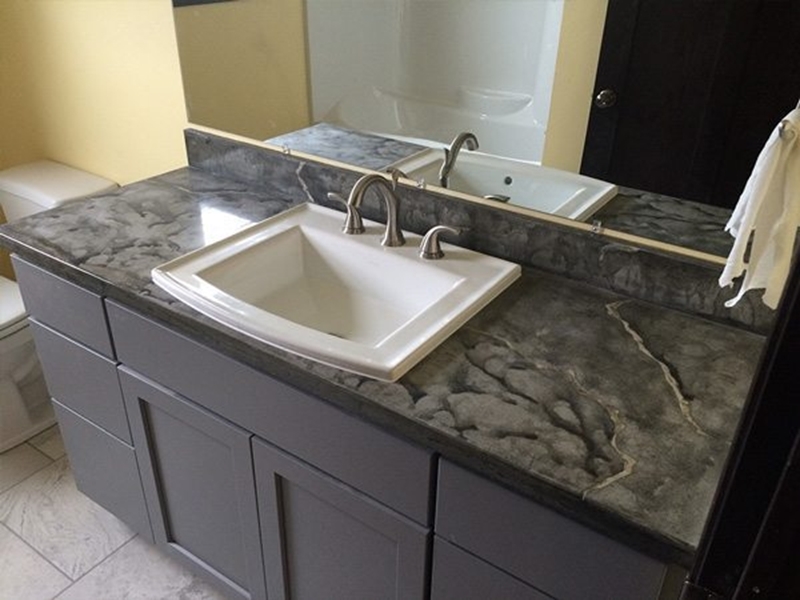 As concrete can last a long time, it’s also considered a very cost-effective and green option, as there is no need to replace your vanity every other year. The expert design team at Bubbles Bathrooms have great experience working with concrete vanities. We can create a personalised vanity that looks great in your bathroom and ties into the entire style of the space. If you want to know more about how to plan your dream bathroom, feel free to reach out to us today – we look forward to hearing from you!